We don’t normally do cover bands on Getintothis. 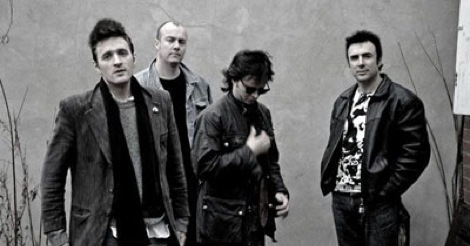 But as Orla Foster found out The Smiths’ number one tribute act are almost on a par with the real deal. Here is a golden opportunity for Smiths fans too young to have caught Salford’s finest during the Eighties. 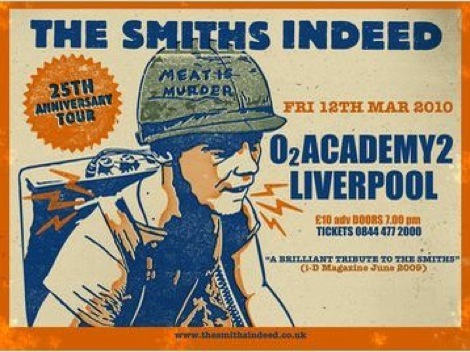 This evening, Liverpool’s 02 Academy is graced by local tribute act The Smiths Indeed, and a room heaves with self-consciously twee haircuts, gladioli, and 3D glasses with the lenses snipped out. Tonight’s gig is split into two parts: first, the Meat Is Murder album played from start to finish, and second, a hearty selection of hits, surely safe territory for pleasing a roomful of Smiths fans. The trouble with tribute acts, however, is that every gesture is scripted. No matter how precisely you can sculpt a quiff or imitate a yodel, there is a risk of the whole thing seeming a bit trite, especially compared to a performer as spontaneous as Morrissey. At first, there seems a chance the band will fall into this trap. ‘I Want The One I Can’t Have‘, for example, loses any pang Morrissey might have put into it, and descends into fey marionette show, with singer JÃÅrgen Wendelen lost in a whorl of chest-pounding and whimpers. But then something clicks into place, and the cabaret approach starts to work. ‘That Joke Isn’t Funny Any More‘ perfectly fits Wendelen’s stage persona. As he lurches, sways and waltzes, his every pirouette motion is mirrored by a barrage of people clasping cameras above their heads. ‘Nowhere Fast‘ and ‘Barbarism Begins At Home‘ are delivered with equal aplomb. It quickly becomes apparent that this track-by-track album rendition is the ideal choice for a tribute act. The structure is already put into place by the record – all the band has to do is recreate it. And Wendelen is eager to recreate every motion of his idol. With each song, a shirt button is unfastened and it seems as though he may be working his way towards a famed blouse hurl. Given that the album’s closing number is vegetarian panegyric ‘Meat Is Murder’, however, it might be for the best that we don’t get a glimpse at his naked flesh. Besides – if he does fling his shirt into the crowd, there is no guarantee that it will be gleefully intercepted by the crowd. He isn’t Morrissey. Or is he? As the band disperse from the stage for a brief interval, shouts of “COME ON MOZ!” emanate from the crowd. Tonight, at least, we’re willing to suspend our disbelief. And why not, when the band have done their homework, from melancholy stage presence right down to the Cilla Black hit which is played during the interval. The audience have done their homework too: many a flower is catapulted towards the stage, and they chirrup along to every lyric, sounding almost like a school choir drafted in for a novelty Christmas record, or The Smiths‘ own Panic. Fortunately, the band’s playful approach stops the gig from turning into a po-faced homage. A briefly discordant moment in Shoplifters Of The World Unite is cancelled out by a guitar solo worthy of Spinal Tap, and a fine roster of props, such as the gigantic noose that is steered around the stage amid cries of “Hang the DJ“, adds to the spectacle no end. As ‘There Is A Light‘ brings the show to a close, the crowd are wreathed in smiles, and look as though they’re only inches away from breaking into a conga. The band nailed it. 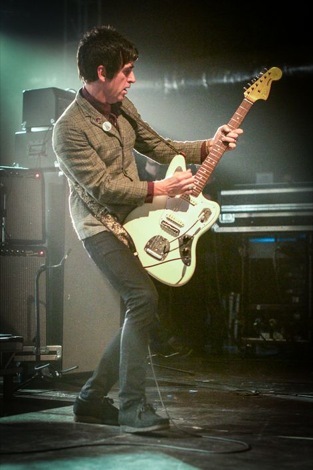 Anybody else in The Smiths tribute racket had better watch out.